I knew that such a book has to exist well before I actually got to know its title or the name of the authors who contributed to it. At first, I tried to construct it piece by piece from other books like the one written by Marie-Claire Bancquart, Paris des surréalistes, and from photographies seen in Centre Pompidou and in books by Brassai. Then I found out that the book I was looking for, Guide du Paris surréaliste had just appeared in March 2012, written by a team under the supervision of Henri Béhar. The structure of the book offers all the necessary details for recreating the itineraries of several well-known surrealist “walks” and offers also a guide for our eyes. The itineraries themselves would not be able to offer us surrealist “landscapes”, we also need to train our way of perception to capture the surrealist Paris. Maps, photos, lists and addresses, descriptions and quotations from surrealist texts help us to achieve this. The majority of the members of the surrealist group grew up in Paris and lived there most of their lives, moving from location to location as young and bohemian people usually do anyway. The structure of the Guide is therefore based on the itineraries of individual lives: we can find a “Promenade Aragon”, a “Promenade Breton” and so on, following the steps of six major surrealist authors – besides Breton and Aragon, we have individual chapters dedicated to René Crevel, Robert Desnos, Jacques Prévert et Philippe Soupault. But we can notice of course that these itineraries intersect themselves several times, and also that the other members of the surrealist group have and intense presence in the book even if they don’t get chapters of their own. So far, the idea of this guide could be easily applied to other artistic movements, in other cities – following the steps of the artists’ lives. But surrealist Paris has some dimensions that make this volume particularly dense and in a way impossible to transfer to other epochs or spaces. 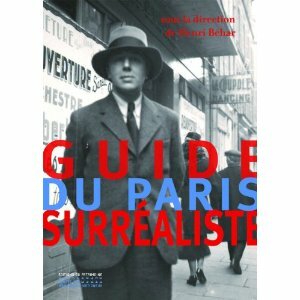 Many authors of the chapters of the volume make reference to a sort of trilogy that is decisive if we try to conceptualize the term “surrealist Paris”. Le Paysan de Paris by Aragon, Nadja by Breton and Les Dernieres Nuits de Paris by Soupault cannot be avoided, and it is easily felt that the routes dedicated to these authors rely much more on the events and places described in these works than on ordinary life facts. A sort of urban mythology emerges from these books that is strengthened later on by the same authors or by their comrades. These books carry the specific attitude necessary to really see the surrealist Paris – the one who describes it is on the move, walking, with a certain disposition to look for the uncommon, for the landscapes, written texts, words uttered by strangers that stir deep emotions in the observer. The question of the lights is very important although not decisive for capturing the surrealist miracles of the urban landscape. This idea is well developed in the chapter dedicated to route Aragon. The passage, so important in Aragon’s book is by default a space with a specific light: it is dimly lit, and as a space it is in-between public and private, closed and open, nocturnal and diurnal. The “miraculous” element comes also from the fact that the surrealist walks take place several times during the night. That is how, when returning the next day to the same place, which is the case with Aragon on many occasions, something different is found there – surrealist places (and objects) are not identical to themselves, they have an ambiguity that renders them ready all the time for potential transformations. This does not mean that the surrealist Paris can be seen only at night, but rather that the walker should be trained through these “nocturnal” views and the nocturnal elements to be able to notice the differences, the transformations that take place when the viewer interacts with the urban landscape. Places like Tour Saint-Jacques (linked to a specific tradition important for Desnos, Breton and others), the passages (present in Aragon’s books and exemplifying the ambiguity of the surrealist landscape), the flea market (Marché aux puces Saint-Ouen, where strange surrealist objects were collected), and of course the meeting points like Place Blanche and Rue Fontaine, cafés situated in specific, but not always predictable zones of Paris are surrealist places of central importance.